Market Lavington Museum’s friendly metal detectorist finds many things made of lead and amongst them are objects whose function was probably no more than to serve as a heavy object. 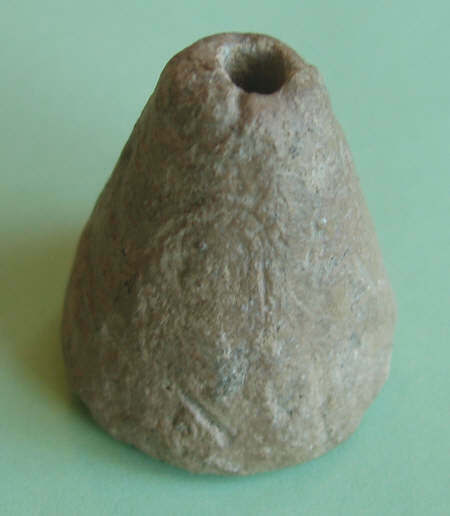 This lead item is a loom weight. Loom weights like this were tied to the warp threads so that they were kept under tension when weaving was done. Warp weighted or vertical looms have been in use for thousands of years and still find use today. This makes it hard to date a loom weight, but we suspect it is late medieval. Older lead items tend to have a thicker crust of white lead oxide on them. This entry was posted on March 15, 2010 at 9:19 am and is filed under Museum. You can follow any responses to this entry through the RSS 2.0 feed. You can leave a response, or trackback from your own site.